I come downstairs from putting the WAHs to bed last night and there are elventynine tweets and texts asking if I'm okay and I immediately think, "Oh no." It looks like it really may be that bad. Well then. Three batters, one out, sixteen pitches. I'm obviously not here for my life lessons-- I simply want to go the zoo with future Hall of Fame pitcher Roy Halladay-- but think on this kids: HLHIII went from Cy Young candidate to "zOMG where the fargle is the blue Powerade?!?!" in about a year. Time is relentless, and spares nothing. Use every moment as best you can. But let's not wallow in despair. Instead, think back on the good stuff (and hope against what seems most logical): That first start in DC, the perfect game, the playoff no-hitter, the Cy Young, SO CUTTERED, Chooch Pillow, death stares, wrestling anacondas in the Amazon, the ubiquitous work ethic... all of it. 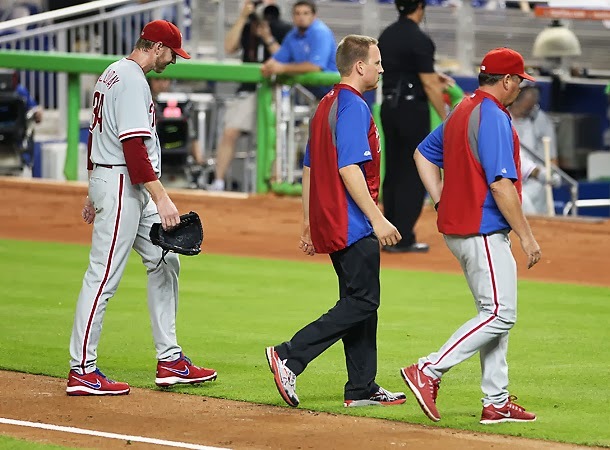 Roy Halladay and the Phillies. But you can still be sad. He'll be back! I can't let another pitcher go on such horrible terms. No! This is Roy Mother-Ducking Halladay! He WILL be FINE! Grieving is the first step towards recovering from something like this. As always, you do an incredible job of summing up the situation. In a word -- heartbreaking. However, we'll always have our memories. It's been an honor and a privilege for root for Doc over the last few years! I bawled like a freakin' baby when I heard this.